I don’t know what the opposite of Indian Summer is. But I know that it is here. It is September, just. Spring looms, yet winter loiters a little. We are on the cusp. The crispness is drifting out. You can hear it in the birds and the mower that hums in the distance and the blow fly stuck in the cobweb. The sun sits higher, things are drying faster and the rain is back. A new liveliness fills the air. You can still buy seasonal oranges, and apples continue on strong. However freshness begins to fill the market stands. The greens are greener. Lighter. We snack as we tend the garden and it becomes empty as the last of the root veggies are pulled. Windows are being opened during the day, and staying open longer too. We are braver, stepping outside with more playful toes and sometimes without shoes. Golden wattle is out, in its fullest strength. Natures true invitation to spring. In the evenings, the air is still cool. A fire is lit, despite the dwindling wood pile. The mornings are getting easier too. We wake with the sun instead of before it. Our start feels natural. Brighter. 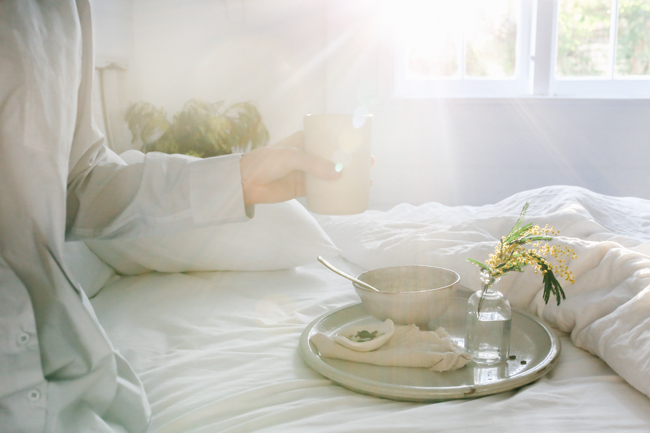 A little extra help to get out of bed is knowing that breakfast has been half prepared the evening before. Food fit for this cusp. 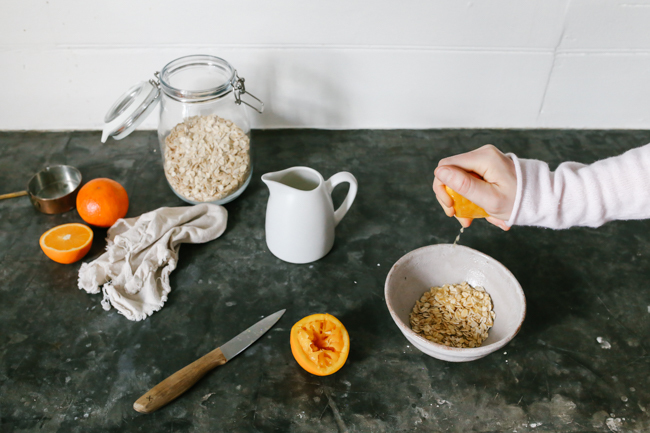 Overnight oats with oranges, apples and local dairy. 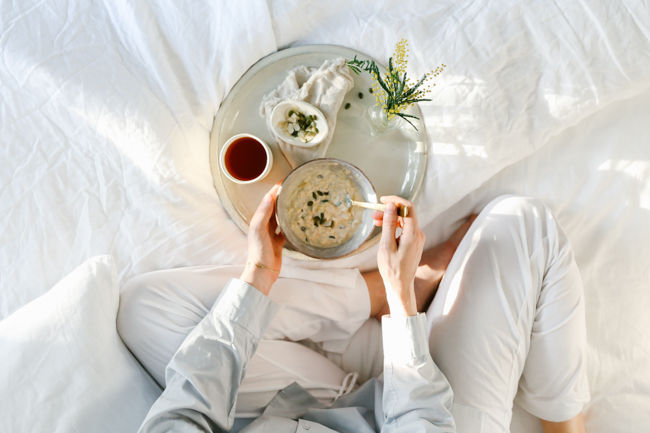 The sweetest of sweet morning comforts and my current daily favourite - Bircher muesli. My recent visit to The Pines dairy farm made me ever so keen to find the perfect recipe for their creamy non homogenized milk and natural set yogurt. I believe this is it. Oats soaked in kind, well loved cows milk and fresh orange juice. Fittingly livened up the next morning with creamy natural set, cultured yogurt, grated granny smith apple, some nuts and seeds and some pure maple sweetness. It feels like eating pudding for breakfast. But better. Well suited to these mornings where winter playfully clashes with spring. 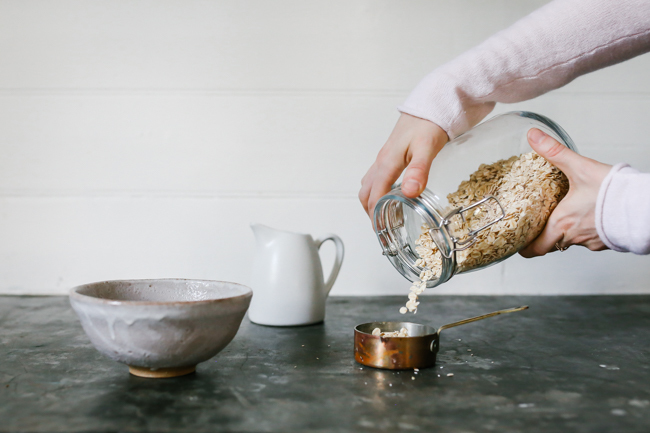 The night before, soak the oats, milk and orange juice together in a bowl (minimum 4 hours). The next morning, stir in the yogurt, apple, almonds, pepitas and maple syrup. Stir well until combined. Divide between two bowls. 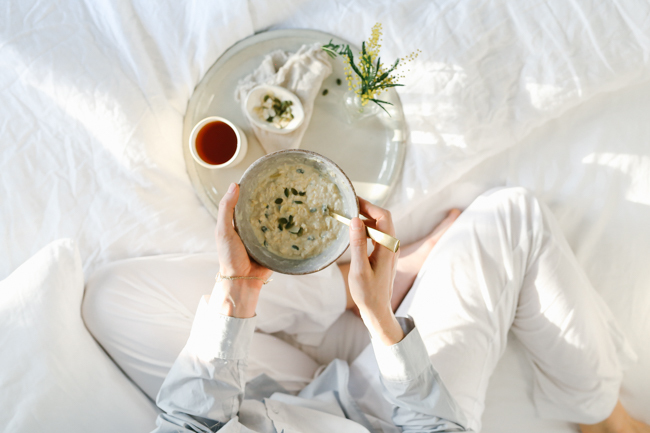 Serve in bed (or wherever) with a pot of breakfast tea. All photos taken at THE COTTAGE Kangaroo Valley.